Synonyms Blechnum sp. #2, B. capense Epithet means "of mountains." 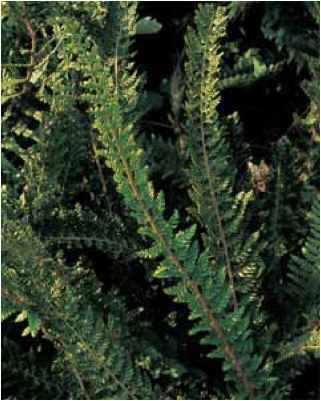 Evergreen, 2 to 3 ft. (60 to 90 cm). Zones 7 to 9. Dimorphic. Blechnum fluviatile in the wild in New Zealand. 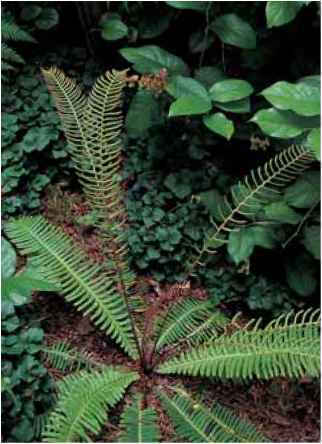 Blechnum fluviatile in cultivation with Elatostema rugosum. scales with darker centers. Once-pinnate, ovate, upright, sterile fronds carry 10 to 12 pairs of pinnae with an upward swing at the pinnule tips. The pairs of pinnae do not taper at the frond base. Erect fertile fronds have linear pinnae enclosing the sori. 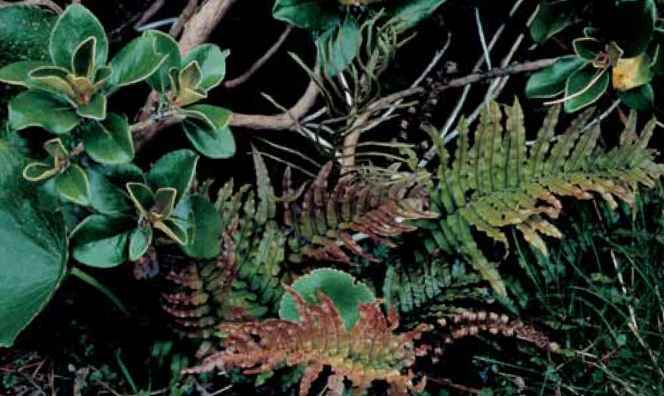 range and habitat: Endemic to New Zealand, this species is a subalpine native in cool and damp mountainous areas. On the west coast of the South Island it is a dominant feature with elegant long fronds swooping down roadside banks. Look for it, complete with pink fronds, on New Zealand's $10.00 bank notes as well. 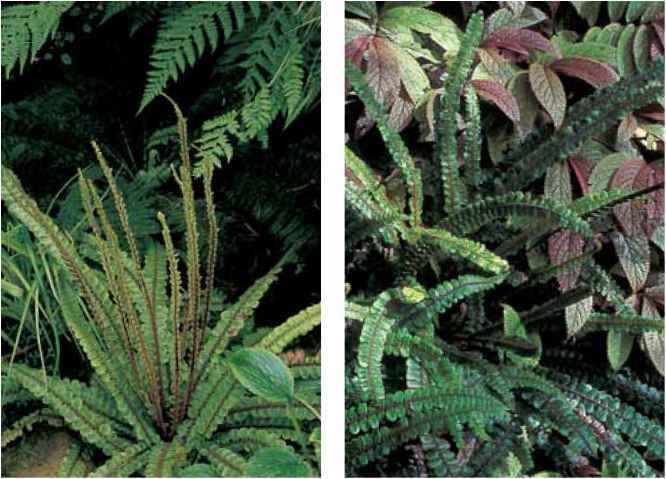 culture and comments: In the 1990s the former Blechnum capense of New Zealand was subdivided, and in anticipation of upcoming botanical research, designated as blechnums 1, 2, and 3. Here we have "Blechnum #2," which reflects its alpine preference versus #1 (B. novae-zelandiae) and #3 (B. triangu-larifolium). By whatever name, with its architectural strength, this fern is to be welcomed as an accent or encouraged as a hillside spreader where it offers a lustrous glow and adaptability in cool and humid temperate gardens. Like many Blech-num species from Down under, it takes some patience to get a response from spores which, when available, should be sown as soon as ripe (or as soon as you can get your hands on them). Blechnum niponicum Japanese deer fern Epithet means "from Japan"
Evergreen, 1 to 11/2 ft. (30 to 45 cm). Zones 6 to 9. Dimorphic. Blechnum niponicum in the Hardy Fern Foundation's woodland planting at the Rhododendron Species Botanical Garden. Blechnum montanum, a colorful New Zealand native found at higher altitudes. green sterile, once-pinnate fronds and upright, deciduous, fertile spikes of equal length. The stipe is essentially nonexistent, but the frond base has a small complement of rusty scales. The blade is widest above the middle and tapers to the ground with 30 to 36 pairs of sessile pinnae. The lowest pinnules are 1/4 in. (6 mm) long. Fertile pinnules are 1/2-in. (13-mm) linear segments with sori running the entire length. range and habitat: This is a fern of mountainous forests in China, Japan, and Korea. A dwarf form is endemic to Japan. culture and comments: Although temperamental as a juvenile, this tidy species displays with elegant restraint in the peat-enriched foreground of lightly shaded woodlands. New growth is an enhancing brilliant pink and fades to a matte green. The species does not take to being moved about, however, and is temperamental from spores. Approximately 10 percent of the sporelings survive until transplant time (which in turn destroys another 10 percent). Once settled, however, this ornamental fern requires minimal maintenance.